The desire and need to nurture, foster and perpetuate Croatian heritage was the inspiration behind the formation of Croatian social, religious and political organizations by Croatian immigrants throughout the free world, and the Milwaukee area was no exception. 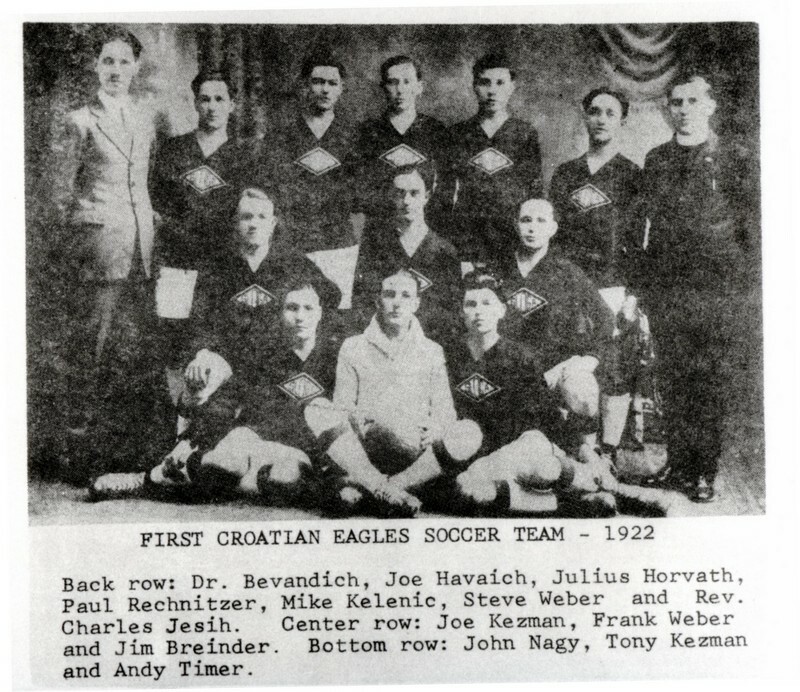 In 1922, the founding of the Croatian Eagles Soccer Club provided the Croatian immigrants in the area with the opportunity to share the love of heritage and soccer with fellow Croatians. Over the past decades many have wondered how the Croatian Eagles name was derived at. In fact, there are two separate stories being told. One story states that the founders were so happy and proud to have become a vital part of the United States that they incorporated its symbol, the Eagles, into the club’s name. The other story indicates that the initial club name was Hrvatski Sokol. When the name needed to be translated into the English language, it was mis-translated as Croatian Eagles. The founding president of the club, and the person most deserving for its organization and growth was Rev. Charles Jesih. According to written records, the following were members of the first major soccer team. Otto Gerhart, Julius Horvath, John Kohler, Mike Markotic, George Mayer, John Nagy, John Newmann, Paul Rechnitger, Peter Roder, Andrija Tajmer, Frank Weber and Steven Weber who was also the club’s manager. The players on the reserve team were Peter Adamovic, Frank Harsh, Joe Kezman, Joe Kovacevic, Frank Markus, John Martinovic, Westley Spencer, Frank Trich and Joe Trich. 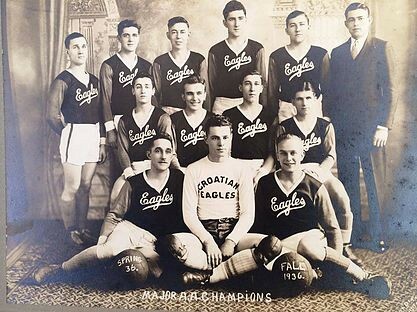 By 1928 the Eagles had two senior and one junior soccer team. In the 1930’s and early 40’s the Eagles enjoyed much success winning championships in 1930, 1932, 1933, 1935, 1936, 1937 and 1943. The Eagles also captured the US Midwest Amateur Cup in 1943. 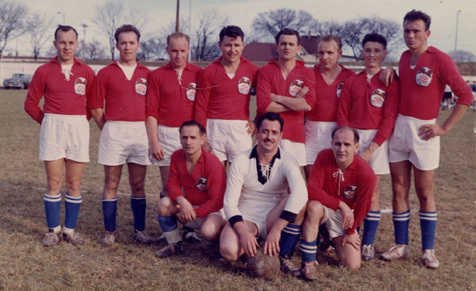 WWII brought an end to the first era of the Croatian Eagles Soccer Club as 23 of its players served in the US Armed Forces and soccer operations were put on hold until after the war. The Post WWII Era (1945-1985) saw many accomplishments for the Croatian Eagles Soccer Club, The most important of these was the establishment of a home field. In 1956 the Federation of Croatian Societies of which the Eagles have been members since 1934 purchased land in Franklin, WI. This land became Croatian Park and has been the home of the Eagles ever since. This era also saw the formation of the Croatian National Soccer Federation of the USA and Canada. In 1964 the first Annual Labor Day weekend tournament was held which brought together all its Croatian member clubs. The Croatian Eagles have competed every year and were the host club in 1967, 1985 and 2001. The Post WWII Era also saw the beginnings of the youth soccer explosion in the US and the Eagles helped pioneer this movement. In addition to our boys youth teams, in the 1970’s the Eagles were one of the first clubs to sponsor a girl’s soccer program. The last two decades have seen the Croatian Eagles grow into one of the area’s premier soccer clubs. Our youth program has grown to 40 teams (boys and girls) consisting of 550 players ranging in age from 4 to 18 yrs. Over 400 families are a part of the club. Our Croatian Eagles Youth Tournament draws 110 teams, nearly 2000 kids entailing 186 games at three different locations. Under the direction and leadership of a quality coaching staff, Eagles teams have won numerous league and tournament championships and in 2005 our U15 boys became our 1st State Cup Champions. Many former and current Eagles youth players have gone on to play college and professional soccer. Currently our Croatian Eagles Soccer Club Adult Program has a Men’s and Women’s Major’s Team, a Men’s Reserve Team as well as two recreational Over 30 Men’s and one Women’s teams, and two U-23 teams. Our Major’s Team is the 2012 US National Open Cup Champions and Wisconsin League Champions while our U-23 team was the Finalist in the 2012 US National Open Cup Championship. 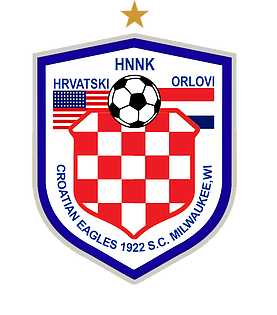 The following members of the Croatian Eagles have earned their place in the Wisconsin Soccer Hall of Fame: Charles Kezele, Stan Kezele, George Panich, John Petek, Julius Horvath, Fred Kezele, Tony Franjic, Aldo Santaga, Steve Botic, Ivo Jugovic, Zdravko Novak, Viktor Zorc, Boris Kuzmanovic, Zdravko Ropac, Steve Bartolic, Zvonko Vujic, Luka Gale and Greg Santaga, Scott Santaga, Steve Sendelbach, Franjo Vukovic, Pero Markovic and Andrija Hampel. As an inclusive organization, the Croatian Eagles have provided opportunities for building soccer skills, and team sportsmanship to players of various ethnic and racial backgrounds, thus reflecting the diversity of Milwaukee, Wisconsin and the Nation.